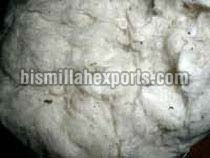 Cotton Waste can be availed form our company. We are engaged in making available first cut, second cut and third cut Cotton Waste that is extensively demanded. A number of manufacturing units use Cotton Waste as raw material for carrying out their production process. We offer good quality Cotton Waste that has requisite properties. One can avail this Cotton Waste at very reasonable prices from us.